Indigenous populations across the world are faced by environmental problems, varrying in size and scope dealing with natural resources. 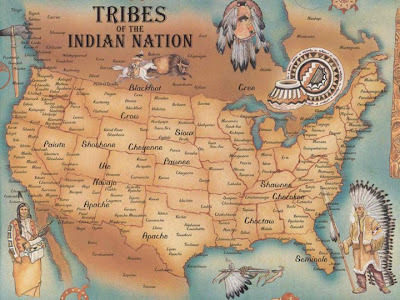 There are currently over 500 native tribes and villages in the United States. 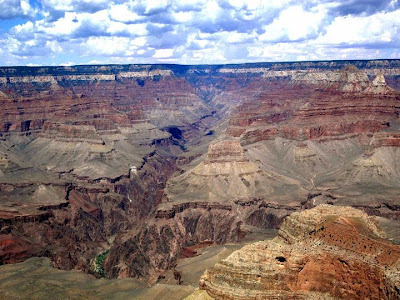 The Navajo Reservation is the largest and also has the highest population. The Navajo Nation is located within the four corners region of the United States. The Navajo nation spans across Arizona, New Mexico, and Utah and covers 27,000 square miles. 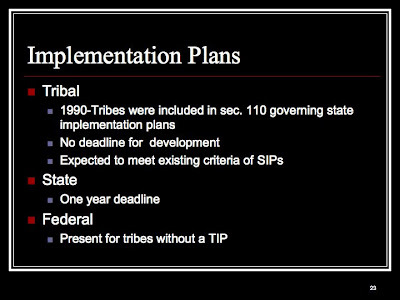 The Navajo Tribe currently has 250,000 tribal members. 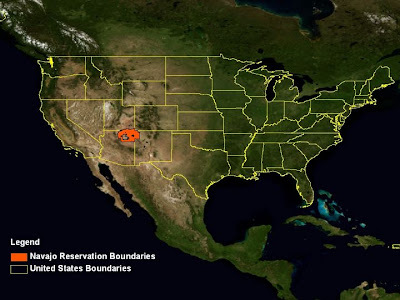 This image was generated using Blue Marble imagery overlaid with US boundaries and Navajo reservation boundary. 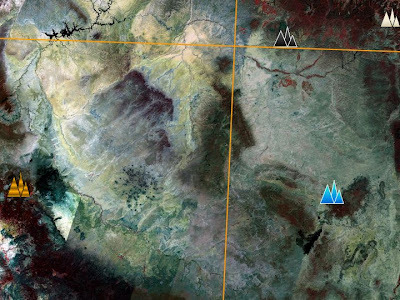 Satellite imagery from the four corners region. 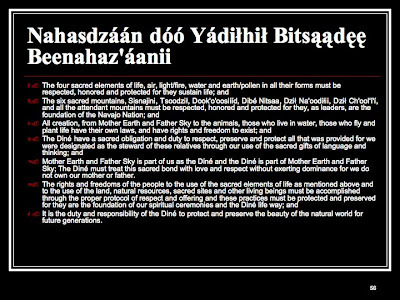 Navajos have a boundary established by our creation stories, these traditional boundaries are non-lineal and and determined by the location of the placement of the four sacred mountains. 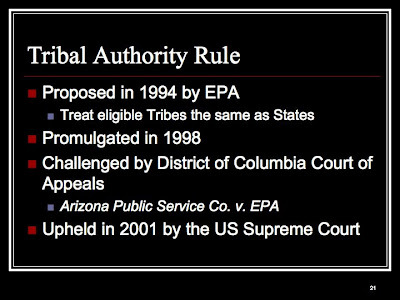 Since the traditional boundaries are non-lineal, the US Government created lineal boundaries in XXXX. 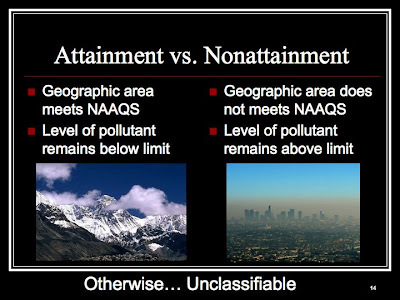 These boundaries contain much of the traditional boundaries. 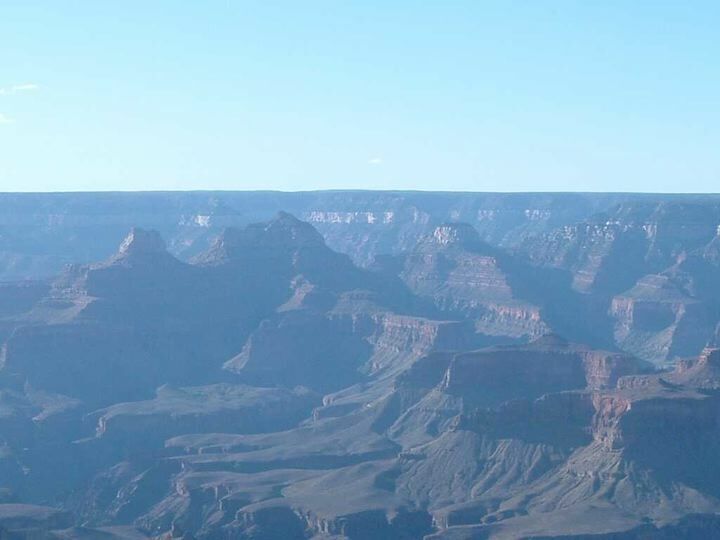 Navajos believe that wind is the source of life. When you inhale, from your first breath, you are taking in the holy spirit and holy people. These being then inhabit your body, they control you thinking, carry yourself, speak, think. 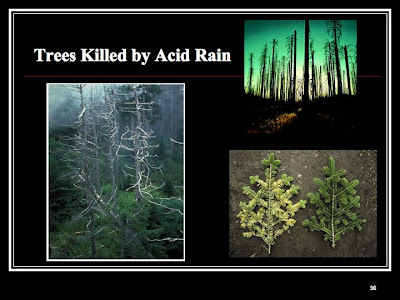 You share this with them and when you leave you exhale your last breath, these being then leave your body. This is similar to teh western concept of a soul. 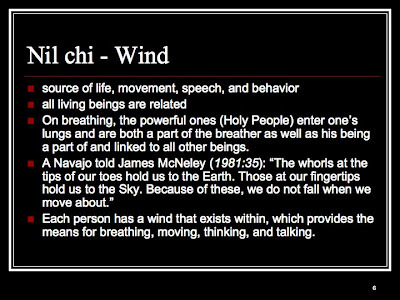 This establishes the importance of why I study air, this is the most important entity in life and it is also what connect s to the other being in this world, we reciprocate each others breath, making us all connected. the creation of the first woman: the holy people were creating life and decided that they needed a human form of themselves. They took a yellow ear of corn, which represents the female, added an eagle feather, layed it down on a piece of buckskin and covered them with another piece of buckskin. Then they backed away and allowed the wind to go through the bundle. Once they removed the top piece of buckskin first woman was there. It was the wind, while passing through the ear of corn, that gave life to first woman, entering through her mouth and exiting at her fingertips and toes. 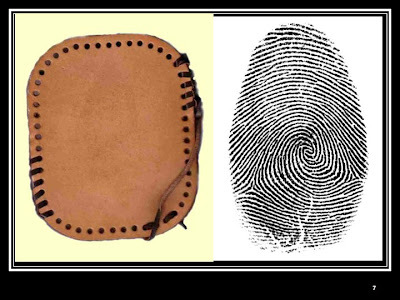 This is why we have fingerprints, the whorls on the tips of our fingers and toes are the spiraling of the wind leaving our body. 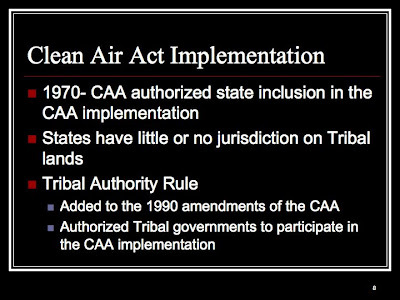 In 1990, the EPA mandated to offer Native American Tribes full partnership in the management of air quality on tribal lands. 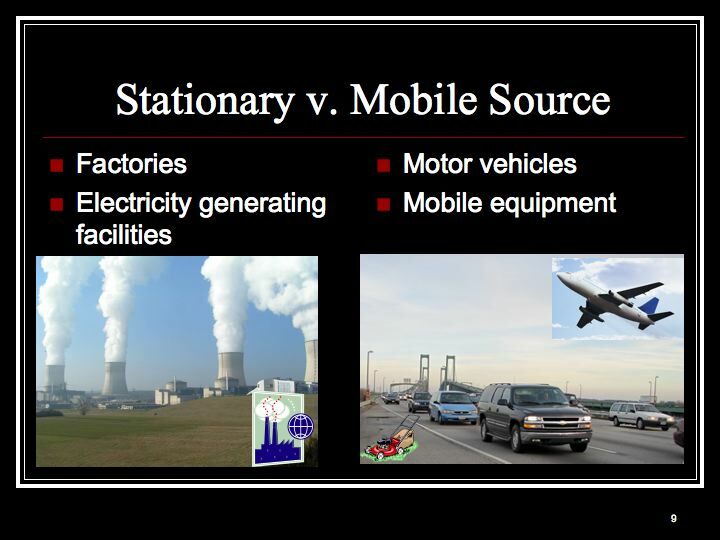 Every geographic area can fall into these two categories. -TAS status requires for lower match. 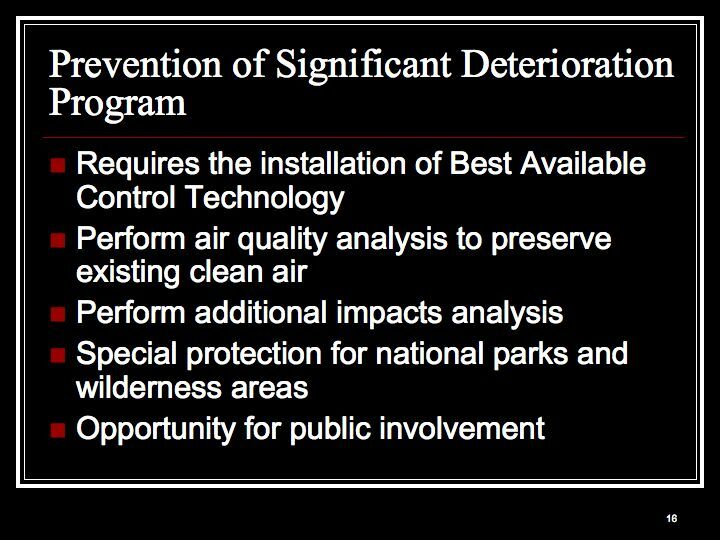 The Implementation Plan is the federally-enforceable plan for each State which identifies how that State will attain and/or maintain the primary and secondary National Ambient Air Quality Standards (NAAQS) . 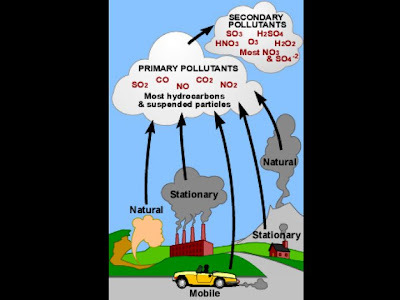 The size of particles is directly linked to their potential for causing health problems. 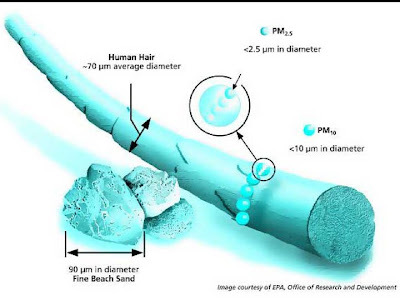 Small particles less than10 micrometers in diameter pose the greatest problems, because they can get deep into your lungs, and some may even get into your bloodstream. 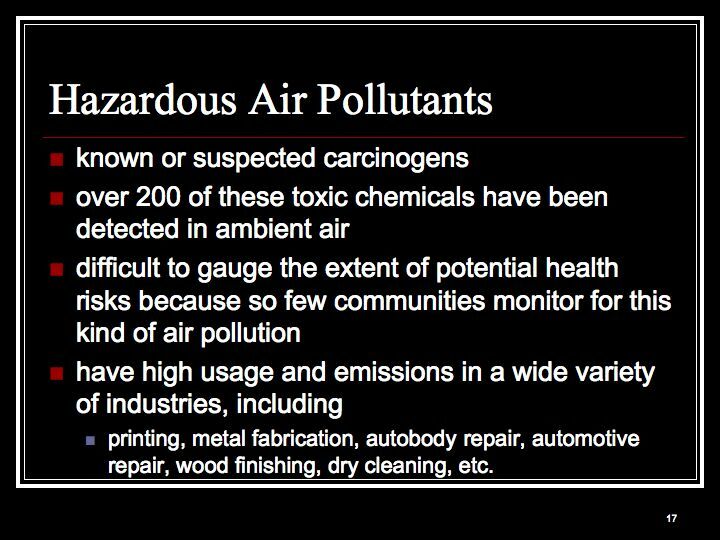 Exposure to such particles can affect both your lungs and your heart. 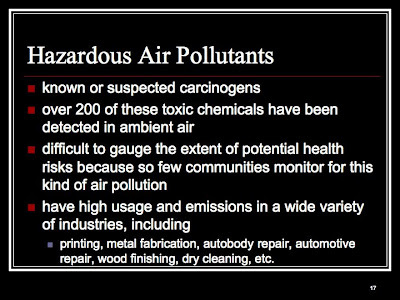 Small particles of concern include "inhalable coarse particles" (such as those found near roadways and dusty industries), which are larger than 2.5 micrometers and smaller than 10 micrometers in diameter; and "fine particles" (such as those found in smoke and haze), which are 2.5 micrometers in diameter and smaller. The Clean Air Act requires EPA to set air quality standards to protect both public health and the public welfare (e.g. crops and vegetation). Particle pollution affects both. 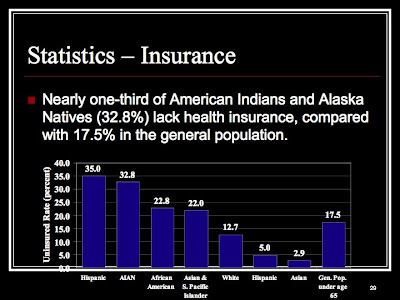 Notes: AIAN have less health insurance coverage than do other Americans, even those with incomes below the poverty level. 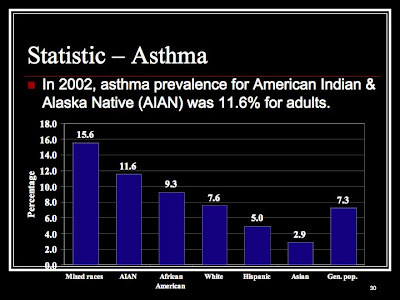 In 2008 the percentage of asthma among people older than 18 years was 12.9 percent for American Indians and Alaska Natives, compared to 13.2 percent for non-Hispanic White. 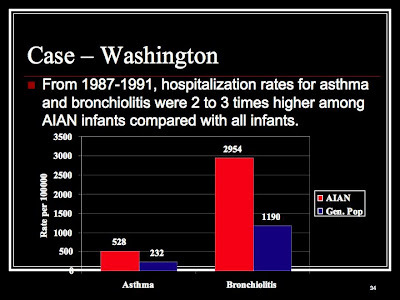 American Indian/Alaska Native children had a 40% higher rate of asthma occurrence in 2008. 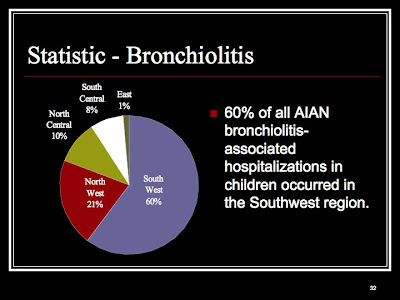 The Pediatric Infectious Disease Journal: Bronchiolitis-associated hospitalizations among American Indian and Alaska Native children, January 2000. 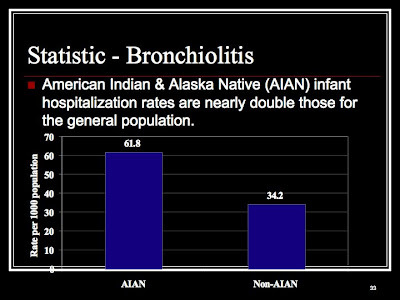 Archives of Pediatrics & Adolescent Medicine: Asthma and Bronchiolitis hospitalizations among American Indian Children, October 2000. 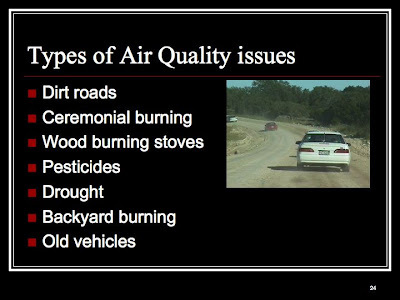 Think of the AQI as a yardstick that runs from 0 to 500. 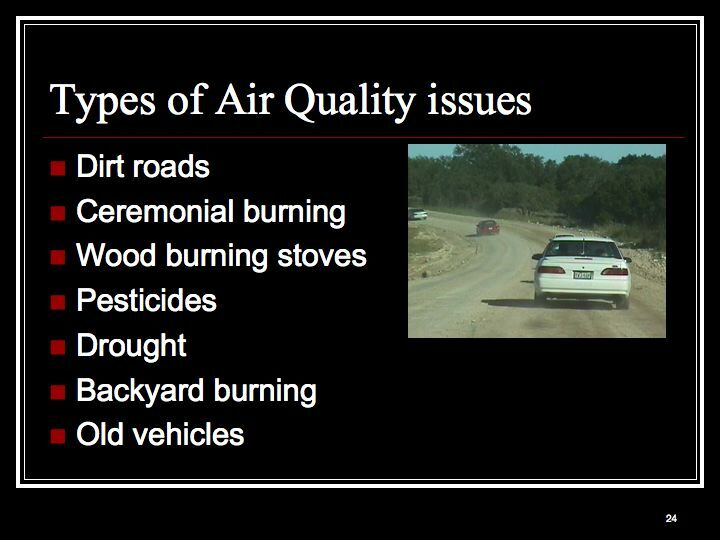 The higher the AQI value, the greater the level of air pollution and the greater the health concern. 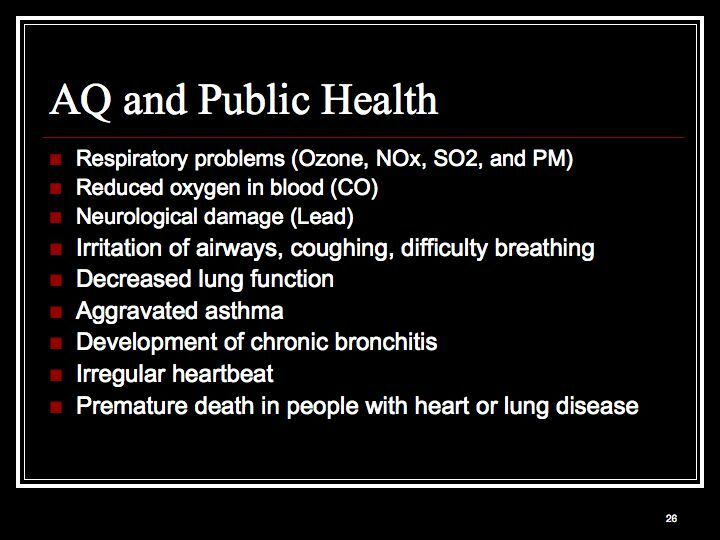 For example, an AQI value of 50 represents good air quality with little potential to affect public health, while an AQI value over 300 represents hazardous air quality. 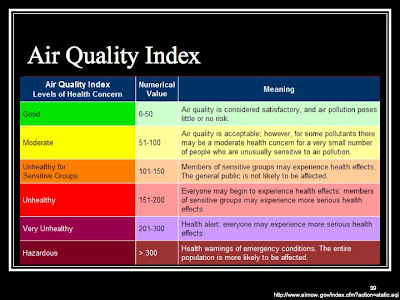 An AQI value of 100 generally corresponds to the national air quality standard for the pollutant, which is the level EPA has set to protect public health. 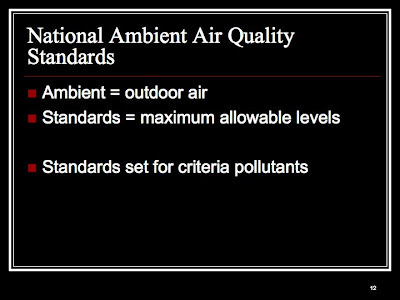 AQI values below 100 are generally thought of as satisfactory. 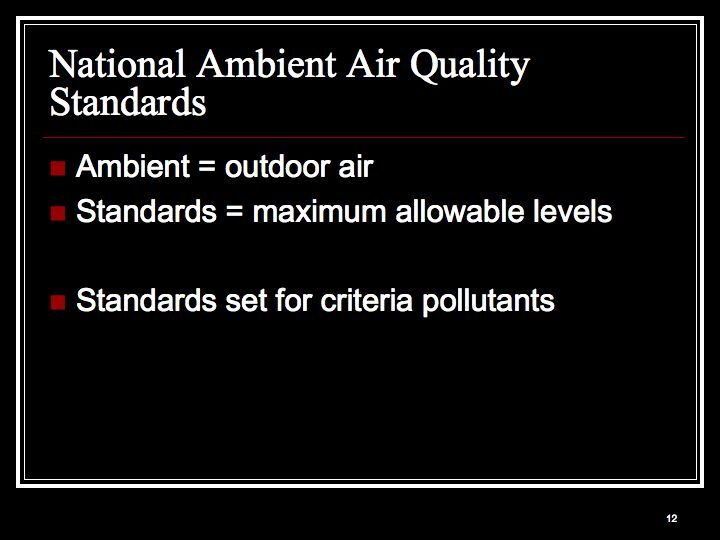 When AQI values are above 100, air quality is considered to be unhealthy-at first for certain sensitive groups of people, then for everyone as AQI values get higher. 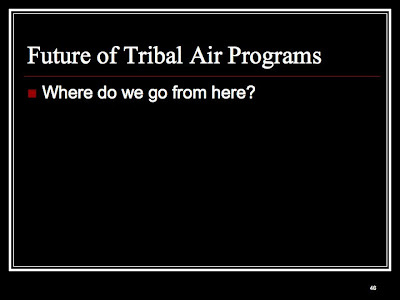 ITEP – Institute for Tribal Environmental Professionals, based out of Flagstaff, AZ who assist in the building of tribal capacity for air quality management, provide high quality and up to date training that is immediately relevant to tribes and to also enhance communication skills to promote collaboration and networking. 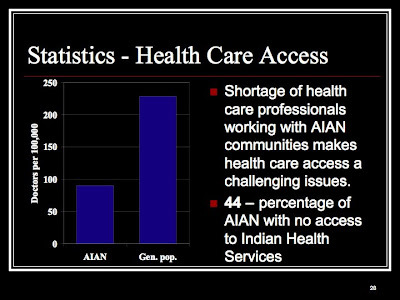 -Navajo Nation doesn’t have any monitors. 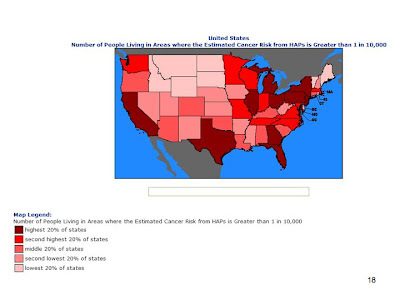 -Need monitors because the circles in the southwest are the largest for the region! 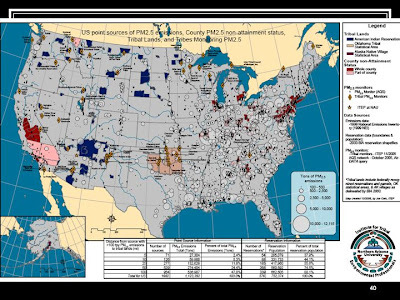 30 major sources in four corners region contribute to emission of particulate matter. 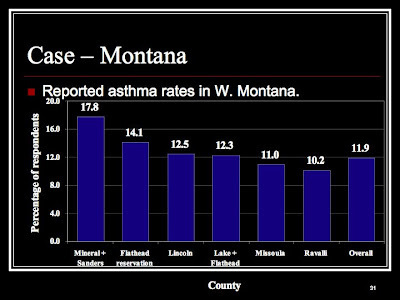 Good that EPA ans Sithe Global see should be overshadowed by health effects of community. 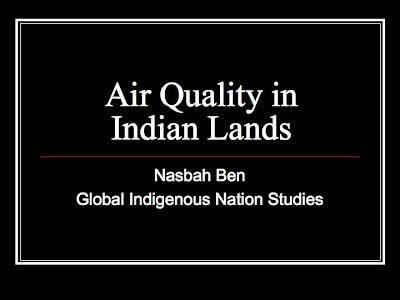 Tribes are monitoring criteria and hazardous air pollutants to better understand their air quality. 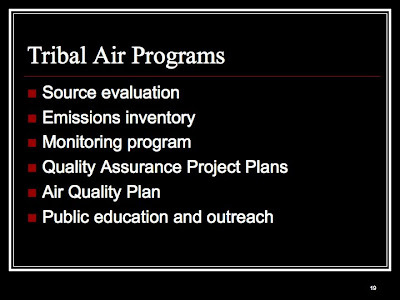 78 tribes are monitoring with 52 reporting their air quality monitoring data to EPA’s Air Quality System. 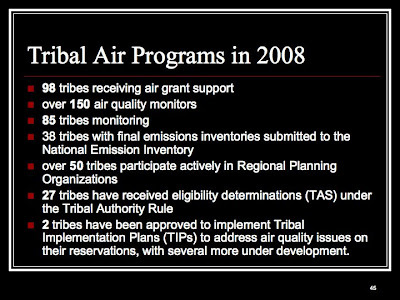 22 tribes are conducting activities and implementing programs to address toxic air pollutants in their communities. 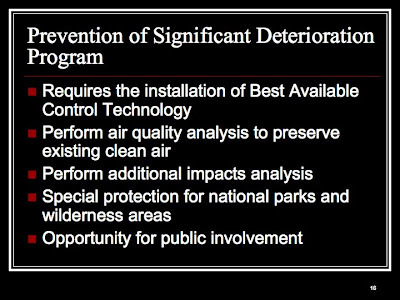 These activities range from monitoring for acid and mercury deposition; to sampling subsistence food sources to measure the accumulation of toxins such as mercury, dioxin and pcb's; to working on assessment projects with other jurisdictions in their area; and doing outreach to their communities. 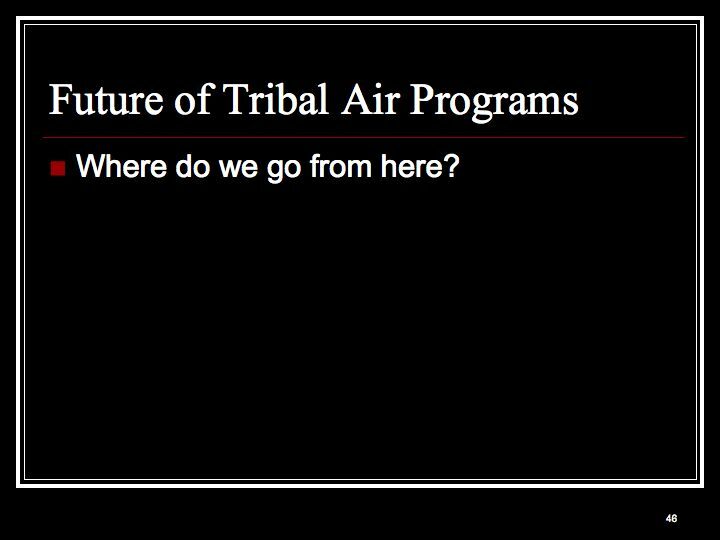 1 tribe completed a diesel retrofit project, and 2 others undertook other projects to address diesel emissions. 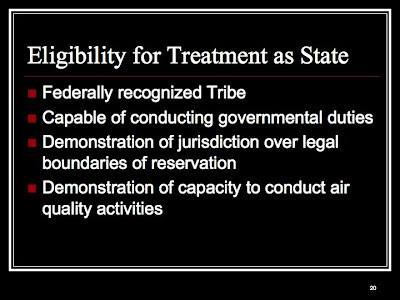 In addition, 32 tribes have received eligibility determinations (TAS) under the Tribal Authority Rule; two tribes have been approved to implement TIPs to address air quality issues on their reservations, with several more under development; and one tribe has received a delegation (under Clean Air Act Part 71) to implement a Title V operating permit program for their reservation. 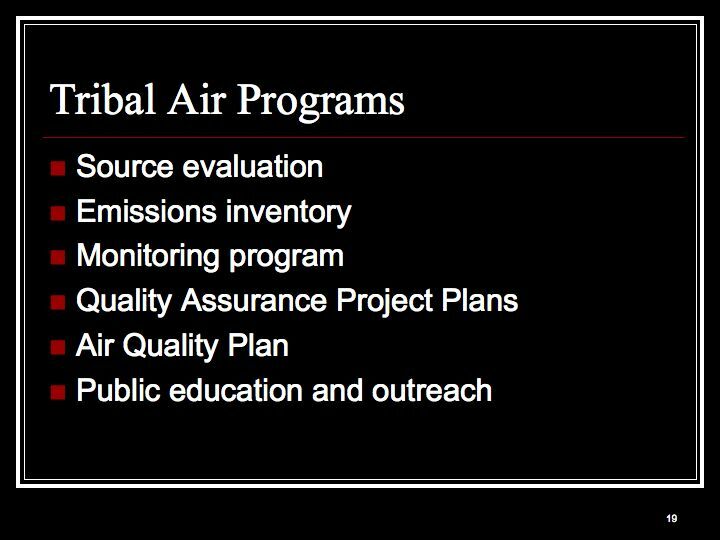 More tribal environmental professionals receive training in various aspects of air quality management and take further steps toward the development of comprehensive tribal air quality programs with each passing year. 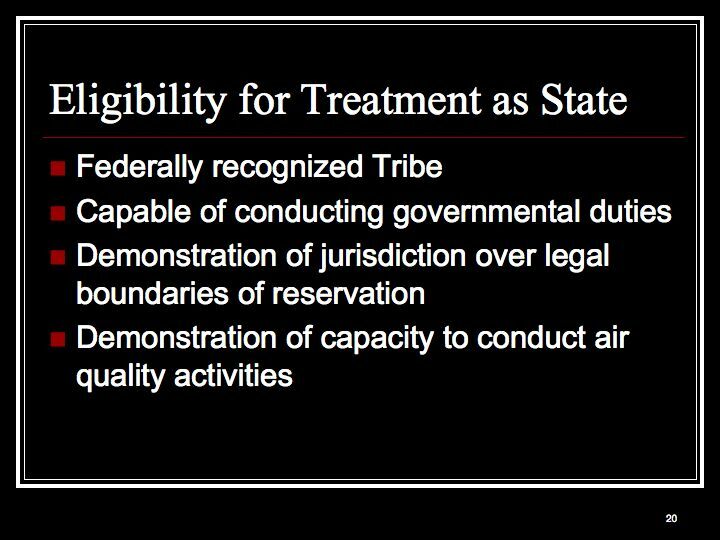 In addition, tribal officials and the National Tribal Air Association continue to participate on the national level through policy workgroups and advisory committees. 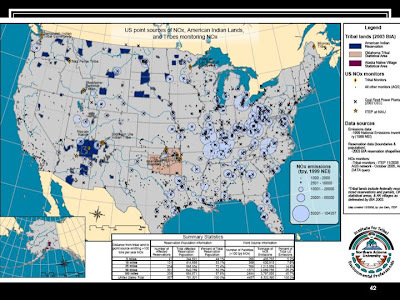 Map of the North American continent overlaid with AOD data darker area indicates less visibility. 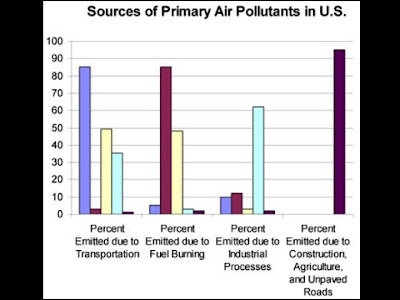 Help to monitor distribution and transportation of aerosols in the air. 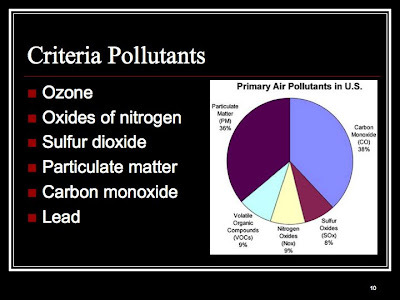 I study particulate matter in the air. 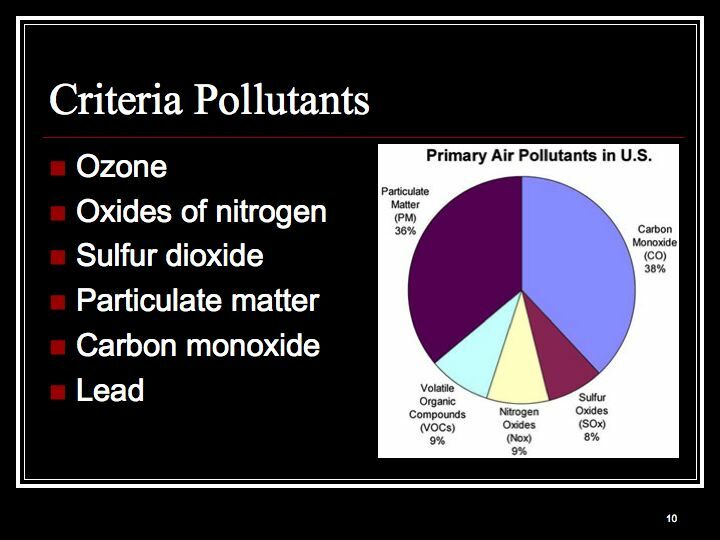 Particulate matter are particules emmited from emmission sources. 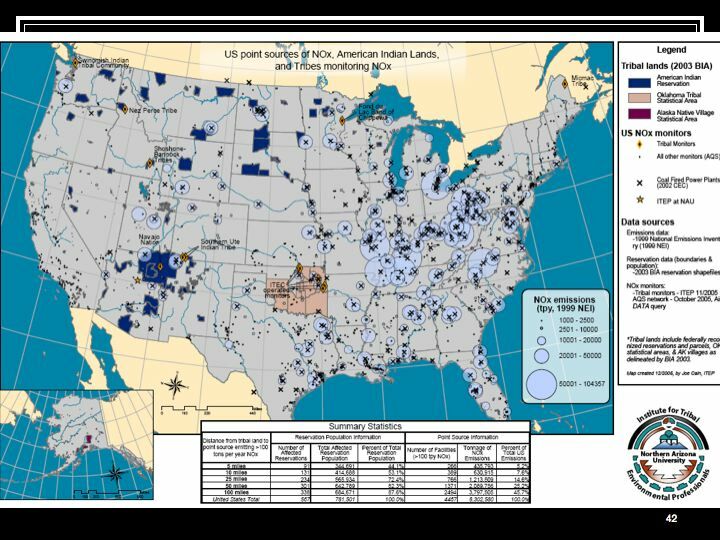 In the Four Corners Region there is an overpopulation of powerplants with 6 power plants within 150 miles of four corners. 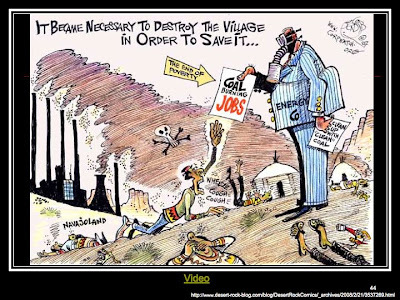 There are also a number of electrical generating station, natural gas stations, and mining operations for coal to supply the power plants that add to the health problems of the nearby populations. 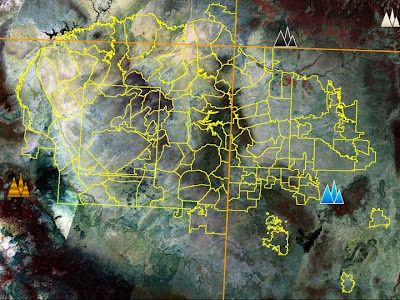 Note how the Four corners area doesn’t have much aerosols…weird inversion going on out there. San Juan Generating Station emitted 13,054,091 tons, ending up number 35 on the list for CO2 (EIP, 2007). 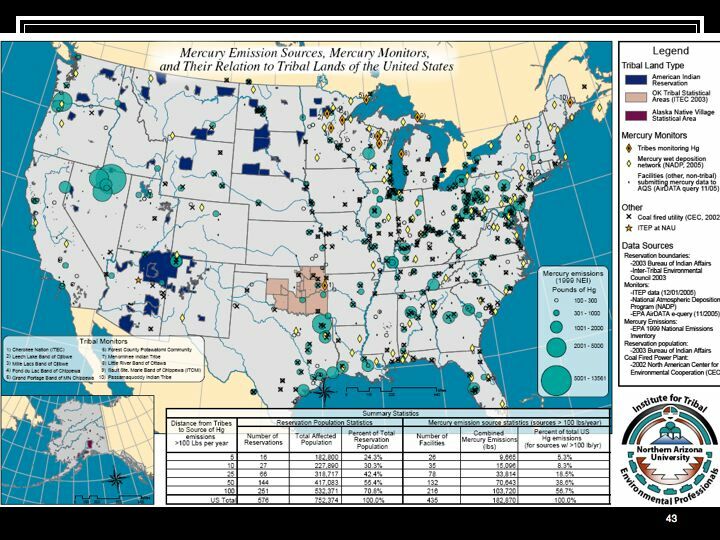 As for mercury, only two of the six stations were on the list. 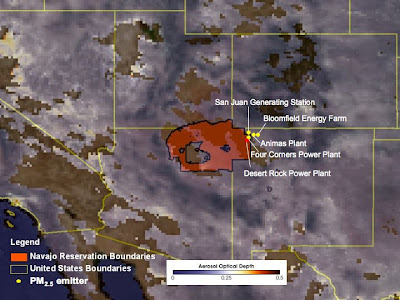 San Juan Generating Station was number 29 on the list, emitting 683 lbs. and the Four Corners Generating Station was number 38 for emitting 562.70 lbs of mercury. (EIP, 2007). 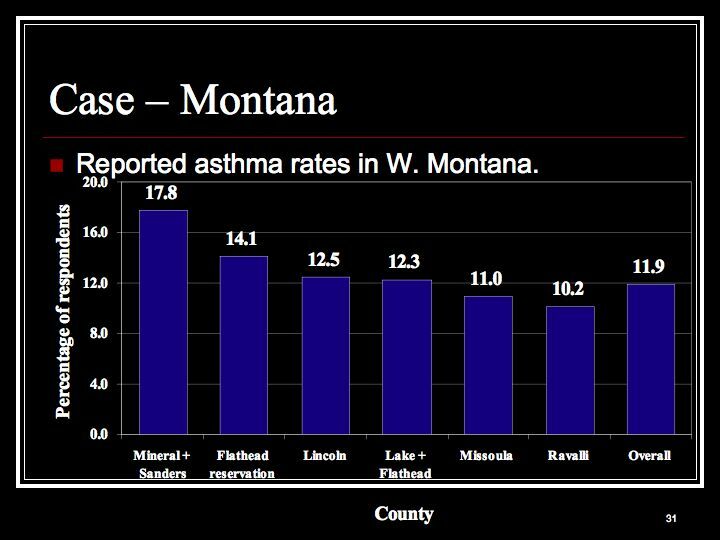 Among all the toxins emitted from the six coal fired power plants within 150 miles, nine toxins emissions increased from 2002-2004. 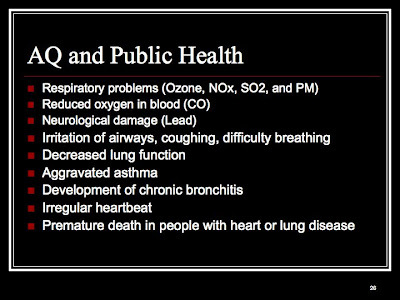 The nine toxins were: barium, chromium, cobalt, manganese, zinc, hydrogen fluoride, sulfuric acid, mercury, and dioxin or dioxin like compounds (DEIS, 2007). 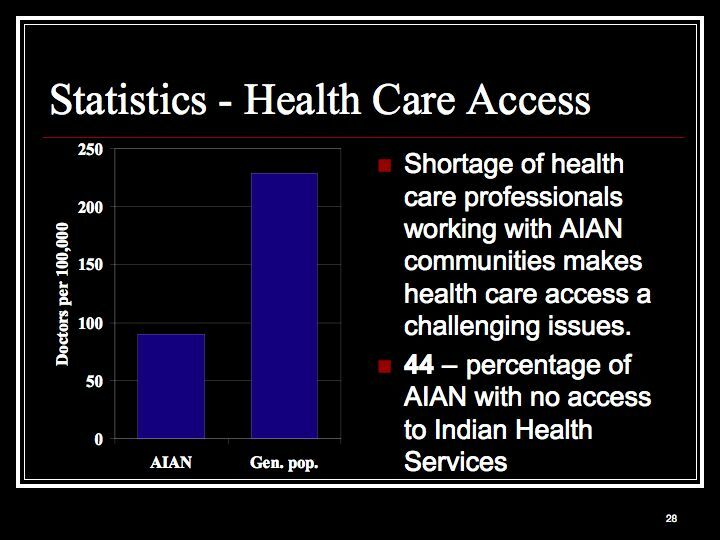 One of the biggest problem that tribes face is access to data! 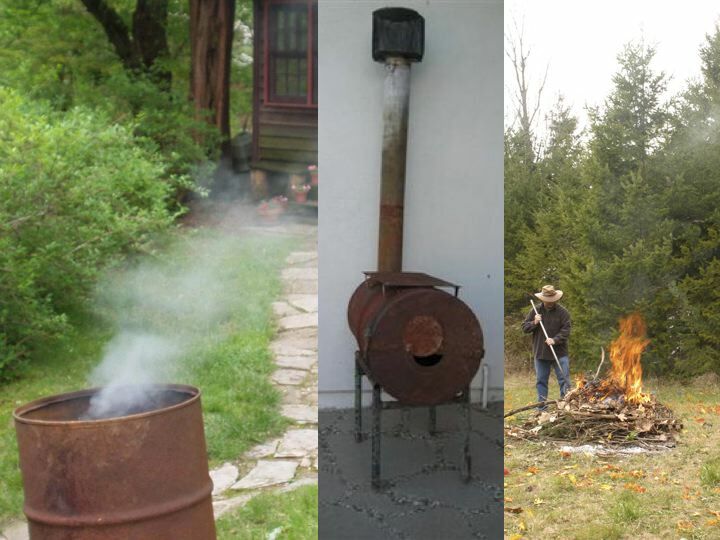 What I would like to do! 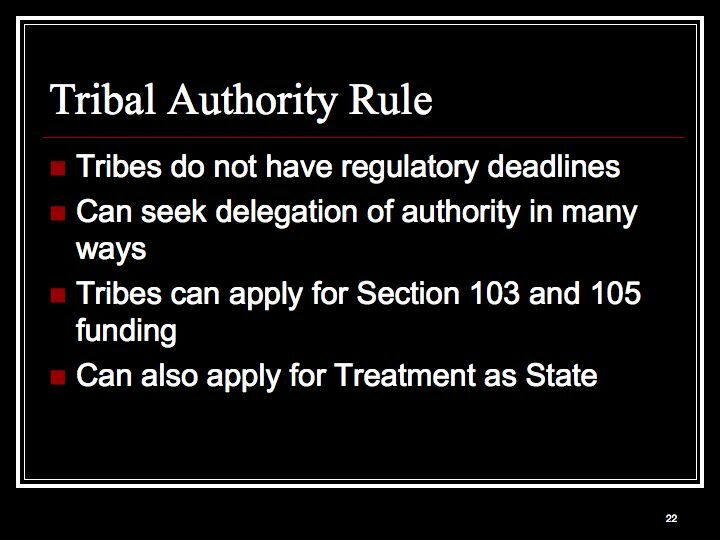 Give tribes another source of data that is free to access. 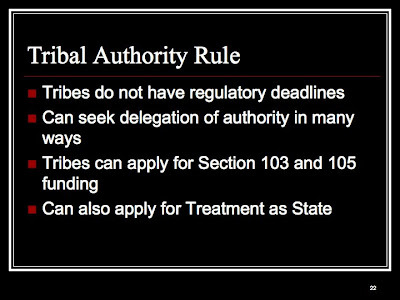 Culturally sensitive events cause management problems for tribes! The MODIS Aerosol Optical Depth (AOD)/ In-situ PM 2.5 correlation summary plot details the correlation between AOD and surface PM2.5 across the United States and parts of Canada. 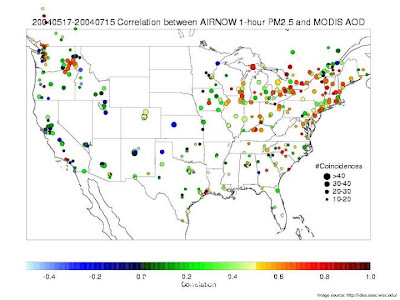 The correlation is based on coincident MODIS AOD pixels and 1-hour PM 2.5 concentrations for the in-situ continuous monitors. The parameter plotted is the monitoring site-specific running correlation coefficient during the preceding 60 days (in color scale). The correlation coefficient has values between 1 (perfectly correlated) and -1 (perfectly anti-correlated). A value of zero indicates that the two measurements vary independently of each other. The running time period is indicated in the title of the plot, (i.e., 20040403-20040602). The size of the point plotted relates to the number of coincidences between MODIS AOD pixels and 1-hour PM 2.5 concentrations for the given period. The significance of the correlation generally increases with increasing number of coincidences. The correlation plot provides site specific and regional perspectives on the utility of MODIS AOD observations for interpreting surface PM 2.5 concentrations. 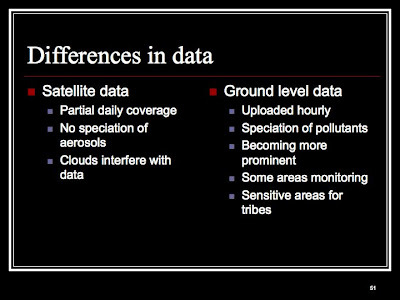 Higher correlations suggest the MODIS AOD pixel is reflective of in-situ surface PM 2.5 mass concentrations at the monitor location. 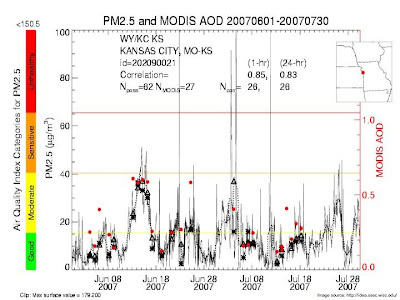 The site specific MODIS Aerosol Optical Depth (AOD)/ In-situ PM 2.5 mass concentration plot details the temporal behavior of the measurements made at a specific monitoring site location during the preceding 60 days. 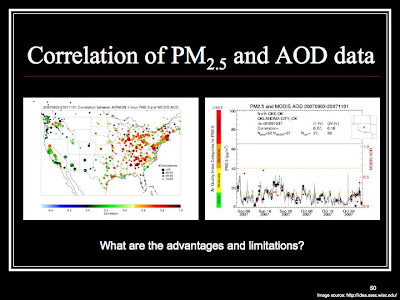 Correlations between the MODIS AOD observations and in-situ PM2.5 measurements are also reported. 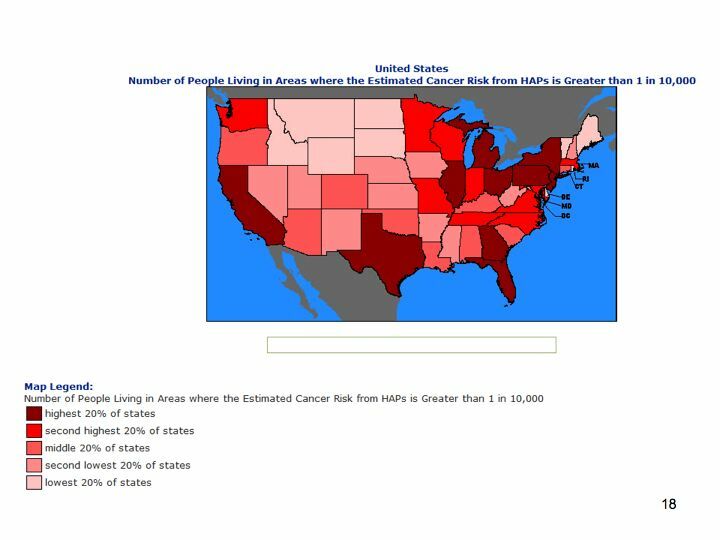 The site name, metropolitan statistical area (MSA), and site identifier are reported on the chart. 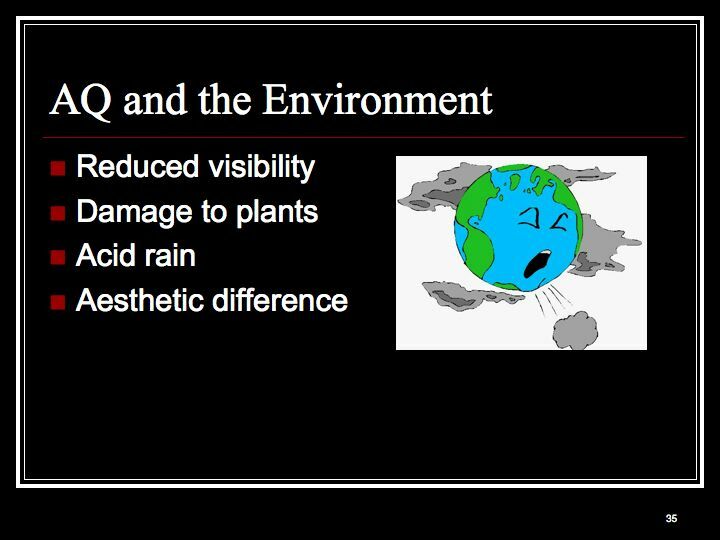 The left vertical axis is mass concentration of PM 2.5 (scale 0 - 100) and the right vertical axis is MODIS aerosol optical depth (scale 0.0 - 1.6). 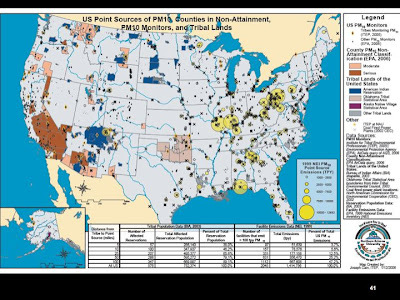 In-situ PM2.5 concentrations from continuous monitors are shown at an hourly frequency for both 1-hour (solid line) and running 24-hour (dashed line) averages. 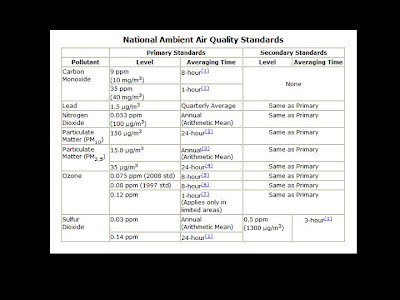 Correlations with MODIS AOD are reported for both 1-hour and 24-hour averaged surface PM2.5 concentration. 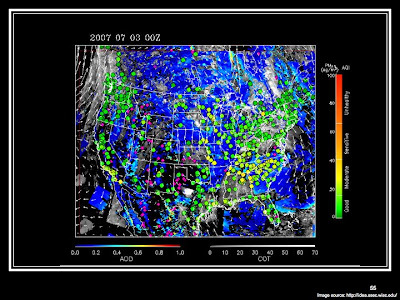 The correlations are based on coincident MODIS AOD pixels acquired within one hour of the surface in-situ measurements. The number of possible MODIS observations during this 60-day period (i.e., the number of times the MODIS sensor views this location) is reported as N_poss. The number of actual AOD retrievals during this period is reported as N_MODIS. 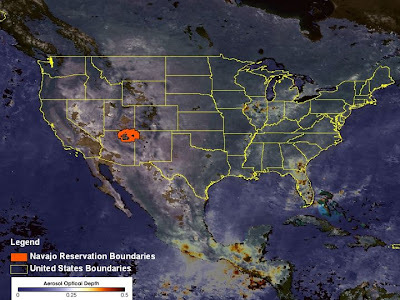 N_MODIS may be less than N_poss due to, for example, the presence of clouds which prevent an aerosol retrieval. The number of coincident MODIS pixels and in-situ PM 2.5 measurements used to determine the correlation are reported as N_corr. The time-series/correlation plot provides site-specific information important to help interpret whether the MODIS AOD is indicative of PM concentrations at or near the surface as measured by the in-situ monitor. 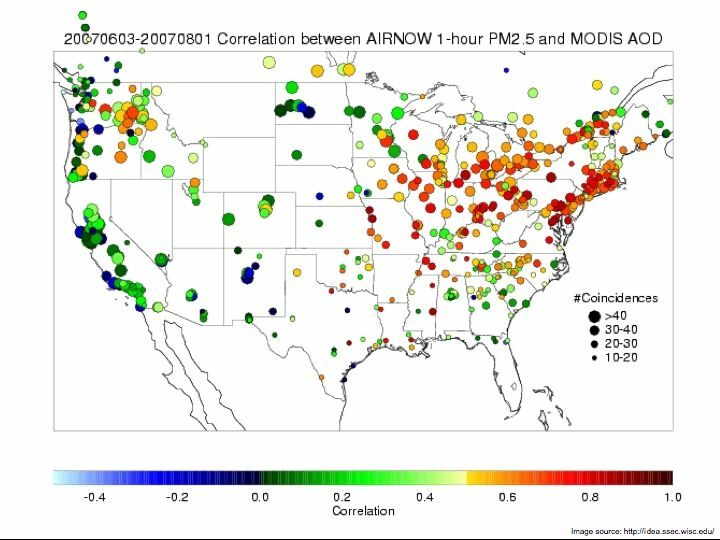 Higher correlations suggest the MODIS AOD pixel is reflective of in-situ surface PM 2.5 mass concentrations at the monitor location. The vertical distance between coincident points is an additional factor to be considered to help determine whether the aerosol viewed by MODIS is well mixed and at or near the surface, or whether the aerosol is aloft. If the distance is relatively small and the MODIS AOD falls on or near the hourly line plot, an inference can be made that the aerosols may be near the surface. 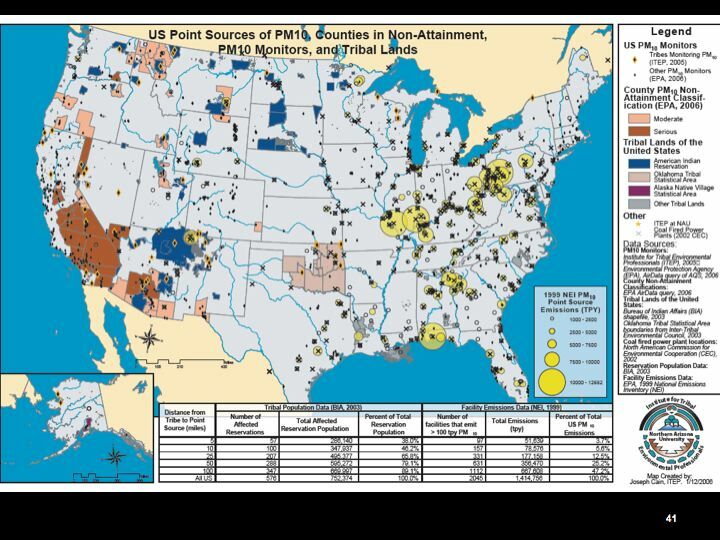 High pressure inversion in four corners region that keeps the pollution there, which in turn affects the health of the residents!